It’s too big for my lil one’s mouth. Fruits get spilled on clothes since the pores r quite big. Better to feed in spoon or syringe. it is made of good quality. no sharp or rough edges. however I recommend to buy this product earlier than one year... when your baby is still trying out new things. its not important if she/he completes the fruit/veggies...the goal is to get their taste buds familiar with new things. my little one is 15 months old...she more plays with it than taste whats inside. hygiene wise...its easy to wash. overall worth the price. 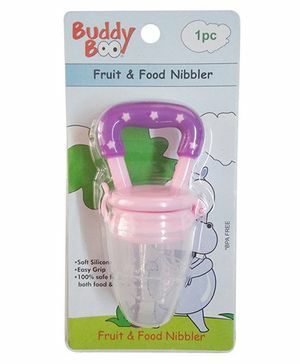 "is good product for baby"